Saudi Arabia is targeting both Israel and Iran with powerful ballistic missiles, new satellite photography shown by military experts to The Telegraph suggests. Image showing two circular launch pads, #1 pointing in direction of Israel, and #2 pointing in direction of Iran. A vehicle-mounted ballistic launcher drives to the launch pads and directs itself along thick dark line pointing at ten o'clock. At the bottom of the image an underground bunker built into the hillside with two entrances, one 12 metres wide and the other 15 metres wide, can be seen, where missiles and their warheads are stored. Administrative and residential buildings are shown at the centre of the image. 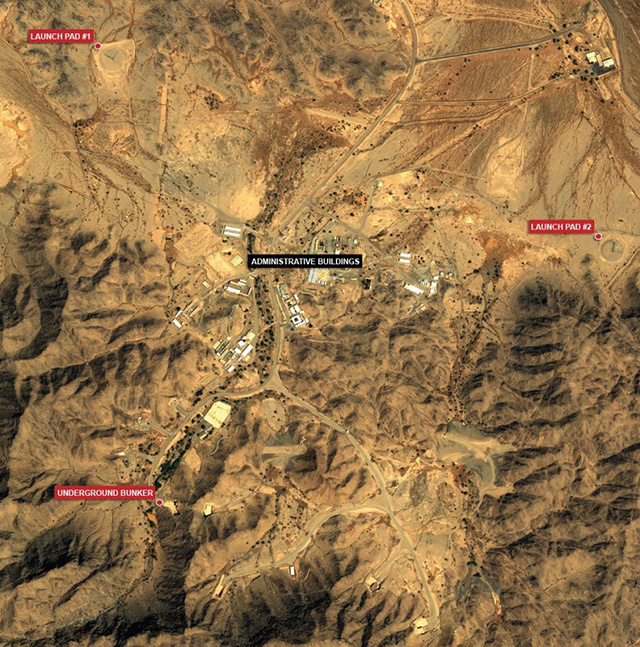 Images analysed by experts at IHS Jane’s Intelligence Review has revealed a hitherto undisclosed surface-to-surface missile base deep in the Saudi desert, with capabilities for hitting both countries. Analysts who examined the photos spotted two launch pads with markings pointing north-west towards Tel Aviv and north-east towards Tehran. They are designed for Saudi Arabia’s arsenal of lorry-launched DF 3 missiles, which have a range of 1,500-2,500 miles and can carry a two-ton payload. The base, believed to have been built within the last five years, gives an insight into Saudi strategic thinking at a time of heightened tensions in the Gulf. While Saudi Arabia does not have formal diplomatic relations with Israel, it has long maintained discreet back channel communications as part of attempts to promote stability in the region. The two countries also have a mutual enemy in Iran, though, which has long seen Saudi Arabia as a rival power in the Gulf. Experts fear that if Iran obtains a nuclear weapon, Saudi Arabia would seek to follow suit.